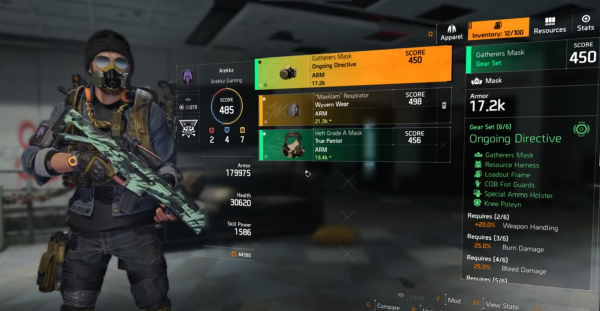 The latest The Division 2 update introduced three new gear sets for you to find, so let’s take a look at where you can get them all and what bonuses they provide. Gear sets grant unique bonuses when two or more are equipped. You’ll need to fulfil certain requirements before you can get your hands on some of them, which we’ve detailed below. In order to use the sets, you must be at least World Tier 4 and can access the Tidal Basin Stronghold. There are six pieces to collect for each set, so head to the Project tab to find the missions and activities linked to them. Once you’ve completed Tidal Basin and have unlocked World Tier 5, you’ll have a new Project to complete called the Hard Wired Prototype Project. You must complete a series of missions in order to unlock different Hard Wired components. Each component is tied to a blueprint and you’re looking for six in total. The list which details the six missions match up with the six components you need to find. Once you’ve collected all the components and donated them for the Project, you’ll then receive six blueprints. You’ll have to go and find more components and Hard Wired tech in order to craft the blueprints which are dropped by Black Tusk enemies. It’s a bit of a grind, but well worth it. If you wear two pieces of the Hard Wired gear set, you’ll get 20% Skill Health. If you wear three pieces, you get 20% Increased Shock Duration. Wearing four pieces will net you 20% Skill Power. Put on five pieces and you’ll be Tamper Proof, where your deployed skills like Hive, Turrets and Pulse Sensor will be electrified, causing nearby enemies to become Shocked every 10 seconds. If you wear all six pieces, you’ll get the Feedback Loop bonus. With this bonus, killing with a skill resets the cooldown of your other skill. Repairing a friendly agent’s armour from zero also resets the cooldown of your skills, and both of these bonuses can be used once every 15 seconds. When a skill cooldown ends or reaches full charge, you’ll gain bonus damage and repair to all skills for 15 seconds. The Hard Wired gear set is by far the most challenging to find and could prove useful in the upcoming raid. There are six pieces in the Ongoing Directive gear set and you’ll get unique bonuses if you wear two or more pieces. If you have two pieces equipped, you’ll get a 20% increase in Weapon Handling. Equip three pieces and you’ll get 25% Burn Damage. Wear four pieces and you’ll get 25% Bleed Damage. 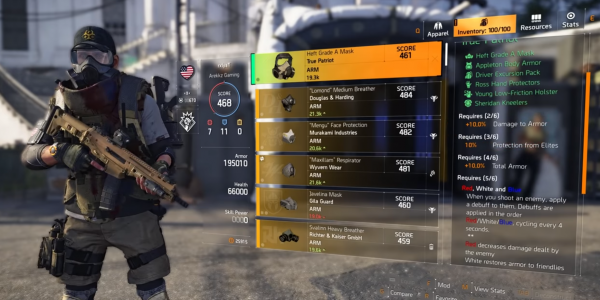 If you wear five pieces, you’ll get Emergency Requisition bonus, where Combat resources like armour kits and ammo within 40m of you are automatically collected. This will repeat every 30 seconds. Wearing all six pieces will unlock The Right Tool bonus. Killing an enemy with a weapon grants some special ammo, like Incendiary or Shock ammo, to one of your other weapons. Arguably the coolest looking set of the three, the True Patriot set is also comprised of six pieces that you need to collect to unlock bonuses. If you wear five pieces, you’ll get the Red, White and Blue bonus. When you shoot an enemy, you’ll apply a debuff to them that cycle through Red, White and Blue every four seconds. Red decreases the damage dealt by enemies, White restores armour to friendlies that shoot the enemy and Blue boosts skill cooldown reduction to friendlies that shoot the enemy. Wearing 6 pieces will grant you the Full Flag bonus. When you shoot an enemy that has all three debuffs applied, you’ll deal 25% damage to nearby enemies that have at least one of the debuffs.